Physical media (like surveillance cameras) and social media (like Instagram and Twitter) may both be useful in attaining on-the-ground information during an emergency or disaster situation. However, the intersection and reliability of both surveillance cameras and social media during a natural disaster are not fully understood. To address this gap, we tested whether social media is of utility when physical surveillance cameras went off-line during Hurricane Irma in 2017. Specifically, we collected and compared geo-tagged Instagram and Twitter posts in the state of Florida during times and in areas where public surveillance cameras went off-line. We report social media content and frequency and content to determine the utility for emergency managers or first responders during a natural disaster. 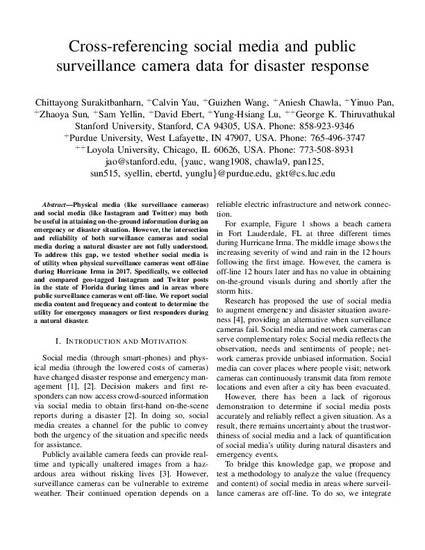 Chittayong Surakitbanharn, Calvin Yau, Guizhen Wang, Aniesh Chawla, Yinuo Pan, Zhaoya Sun, Sam Yellin, David Ebert, Yung-Hsiang Lu, and George K. Thiruvathukal, "Cross-referencing social media and public surveillance camera data for disaster response", In Proceedings of 2018 IEEE International Symposium on Technologies for Homeland Security.